November 24, 2010 - FlightNetwork, one of Canada's leaders in online travel, announced the results of their latest 'State of Air Travel Poll,' aimed at giving Canadians a voice to weigh-in on the biggest issues facing the travel industry in 2010. As thousands of Canadians are set to fly across the border for American Thanksgiving, FlightNetwork newest poll asked Canadian consumers to identify America's worst International Airports. Of the 783 Canadian consumers polled, 20.1% of respondents named Chicago O'Hare as the worst airport in the USA. Los Angeles International came in a close second at 17.5%, followed by New York ? JFK with 14.4%, Miami International at 9.5%. Las Vegas McCarran International Airport at 6.0%, Orlando International at 5.7%, Denver International at 5.2%, Dallas Fort Worth at 5.1% and San Francisco International Airport at 3.1%. 13.4% of respondents indicated 'other.' "Our poll has revealed that Canadian consumers seem to have different expectations of Canadian and American airports," said Naman Budhdeo, CEO of FlightNetwork. "Our recent poll of Canada's worst airports found that Canadians' number one complaint was bad service (17.5%) followed by overcrowding (13.9%.) Canadians are clearly feeling much more overcrowded at American airports and seem to have generally accepted Homeland Security delays and the available amenities." Running until February 2010, the State of Air Travel Poll will utilize FlightNetwork blog, Facebook page and customer database to reach Canadians and ask for their input. Poll topics will cover a range of issues including green travel, plus sized passengers, if cell phones should be allowed on planes and Canada's best and worst departure lounges. Chicago O'Hare International Airport, also known as O'Hare Airport, O'Hare Field, or simply O'Hare, is a major airport located in the northwestern-most corner of Chicago, Illinois, United States, 17 miles (27 km) northwest of the Chicago Loop. It serves as the primary and largest hub for United Airlines. Following United's merger with Continental Airlines, O'Hare will become the second largest hub for United after Houston's George Bush Intercontinental Airport. O'Hare is also a hub for American Airlines. It is operated by the City of Chicago Department of Aviation, associated with an umbrella regional authority. In 2008, the airport had 881,566 aircraft operations, an average of 2,409 per day (64% scheduled commercial, 33% air taxi, 3% general aviation and <1% military). Prior to 2005, O'Hare was the world's busiest airport in terms of takeoffs and landings. Mainly due to limits imposed by the federal government to reduce flight delays at O'Hare, Hartsfield-Jackson Atlanta International Airport became the busiest by that metric in 2005. O'Hare currently accounts for over a sixth of the nation's total flight cancellations even after the limitations. O'Hare International Airport is the third busiest airport in the world with 64,397,782 passengers passing through the airport in 2009, a −9.07% change from 2008. It is the world's second busiest airport in terms of aircraft movements. 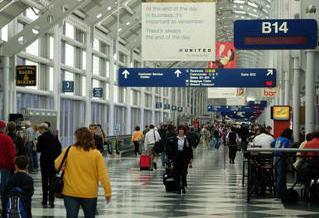 O'Hare has a strong international presence, with flights to more than 60 foreign destinations. O'Hare is the fourth busiest international gateway in the United States with only John F. Kennedy International Airport in New York City, Los Angeles International Airport and Miami International Airport serving more international passengers.